Marianna City Hall is located at 2898 Green Street, Marianna, FL 32446; phone: 850-482-4353. Photo: Joseph W. Russ, Jr. House, ca. 1895, 310 West Lafayette Street, Marianna, FL. Listed on the National Register of Historic Places in 1983. Photographed by User:Ebyabe (own work), 2007, [cc-by-2.5 (creativecommons.org/licenses/by/2.5)], via Wikimedia Commons, accessed June, 2014. Marianna lies near the center of the Florida panhandle, about 70 miles west of Tallahassee, the state capital. It is the seat of government of Jackson County, which borders the states of Georgia and Alabama on the north. Its other sides are bounded by Holmes, Washington, Calhoun, Gadsden, and Bay counties. The county is largely rural and Marianna is the only city having a substantial population. About 60 percent of the county's population lives in Marianna, which has about 7,000 residents. The economy of Marianna and Jackson County depends largely on agriculture. The surrounding terrain is hilly and fertile, making it possible to raise a wide variety of crops. Settlers began arriving in Jackson County in the Jackson County area almost immediately after the United States acquired Florida from Spain in 1821. The county had fewer than 200 residents when the Territorial Legislature created it in 1822. That number had risen to more than 2,500 by 1825. Pioneers were attracted to the area by the fertile soil, which was ideal for the growing of cotton and tobacco. The county government had no permanent home until local voters selected Marianna as the county seat in 1829. The town had been platted in 1827 on a 240 tract of land east of present-day Caledonia Street. The city was incorporated in 1828 and originally consisted of a small collection of log cabins and crude wood frame houses. Work began on a two story, wood frame courthouse in 1829. When completed, it was described as "the finest courthouse in the territory." Marianna grew rapidly and soon could claim several large and comfortable houses, two banks, and a number of merchants. In the antebellum period, Marianna became one of the most important and prosperous towns in the western Florida panhandle, with an economy resting mainly on the growing of cotton. Each year, riverboats carried thousands of bales of cotton along the Apalachicola River to the cotton warehouses of the City of Apalachicola on the Gulf of Mexico. From there the cargo was shipped to textile mills in the northern states. Wealthy planters and merchants in Marianna constructed large homes that reflected the fortunes they had made in the cotton and tobacco trade. Among the more notable homes erected before the Civil War are the Theophilus West and Ely Criglar houses, both of which date from the 1840s. Several other notable structures in the community also survive from the antebellum period. During the Civil War, Marianna and Jackson County became an important source of supplies for the Confederacy. Beef, salt, and a variety of other necessities were shipped to Southern forces fighting in a number of states. In an attempt to stop the flow of these goods, General Alexander Abbott attacked Marianna with a strong detachment of Union regulars on September 27, 1864. The raid resulted in the capture of 81 Confederate prisoners, the seizure of 600 slaves, and the taking of a large number of cattle, horses, and mules. The town suffered little physical damage in the brief but fierce battle. Much more destruction was caused in 1865 by an accidental fire that destroyed most of downtown Marianna, including the courthouse. The war left the economy of Jackson County and Marianna severely crippled for almost two decades, but in the early 1880s the area witnessed a dramatic revival of agriculture and other businesses. The arrival of the Pensacola and Atlantic Railroad in 1882 followed by the Louisville and Nashville Railroad a year later brought renewed growth and prosperity to Marianna. A fire destroyed several buildings in the downtown area in 1883, prompting city leaders to insist that all new commercial buildings erected in the business district be of "fire proof" masonry construction. In 1884, the Sanborn Map Company produced the first series of fire insurance maps for the town. The maps show the principal area of commercial development at the time was concentrated along Lafayette Street (then called Main Street). The district lay north and northwest of Courthouse Square and along Madison Street, just east of the courthouse. Residential development in the town of 1,200 residents was limited mainly to that area of Lafayette Street west of Courthouse Square and along Jefferson and Green streets north of Lafayette Street. By 1915, the population of Marianna had grown to 2,800. The town spread west along Lafayette Street and began to fill in the vacant lots in the blocks surrounding Courthouse Square. Numerous residences were erected in the six blocks bounded by Putnam, Madison, Clinton, and Caledonia streets. The city also began construction of paved streets and sidewalks in 1915. The same year, however, the economy of Jackson County suffered a serious blow when the cotton crop was nearly wiped out by a boll weevil infestation. Cotton production dropped from a high of 23,000 bales in 1913 to less than 2,000 bales in 1916. County residents began to rely more heavily on the area's other agricultural resources, such as the large stands of long leaf pine found on uncultivated land. The trees were the source of milled lumber and turpentine, the latter of which was used in the production of paint, varnish, and other useful items. Watermelons, tobacco, and peanuts became important cash crops. Another moderately successful venture, at least for a time, was the cultivation of the Satsuma orange. The fruit had been imported from Japan in the nineteenth century and could tolerate somewhat colder weather than the varieties of citrus grown in central and southern Florida. Another business development was the quarrying of local limestone for the construction of buildings. The First National Bank (1907) was constructed of this native stone. The economic depression that swept the nation after the stock market crash in 1929 was keenly felt in Marianna and other rural communities in Florida. Businesses failed and ready cash was in short supply. The county government was forced to suspend foreclosure on properties for delinquent taxes, since most such properties could not be sold at public auction for any price. Congress created the Reconstruction Finance Corporation at the request of Herbert Hoover in 1932. The agency was authorized to provide $500 million in emergency loans to local financial institutions which, in turn, would stimulate employment through the funding of work relief projects. Victory over the Axis powers in 1945 brought an end to the economic revitalization that Marianna had experienced during World War II. The Marianna Army Air Field was deactivated, and the population of Marianna declined sharply as military personnel were discharged from service, returned to civilian life and moved away. Retail businesses that had enjoyed the patronage of military families and townsfolk with money to spend during the war now found the number of shoppers in their stores sharply reduced. The economic downturn that followed the end of the war, however, was not as serious as the Great Depression. Economic conditions slowly improved as America's industries switched to peacetime production. Many Americans were left with considerable amounts of money saved during the war, when many desirable goods were unavailable. A recovering Europe needed new capital machinery and construction materials to rebuild its shattered economies. American factories and suppliers provided the bulk of these necessities. This sparked a new era of prosperity across the county in the early 1950s. The outbreak of the Korean War in 1950 saw the reactivation of the old army airfield as Graham Air Force Base. The facility eventually employed about 700 military and civilian personnel before the end of the conflict. Both permanent military and civilian personnel built homes in the Marianna area. The base continued to play an important role in the economy of Marianna after the war ended in 1953. The permanent closing of the facility in 1960 was a serious blow to the economy of Marianna, depriving the community of a $6 million annual payroll. When the former base was offered for sale as surplus federal property, local business interests purchased the tract to be used as a local airport and industrial park. This move began to have a significant economic impact after only a few years. By 1966, new firms operating at the site employed approximately the same number of people as had worked at Graham Air Force Base. Agricultural enterprises also continued to play a major role in the economy of Marianna. Changes in farming techniques increased yields and improved the quality of crops produced in Jackson County. The era of the "two mule farm" had vanished with the Great Depression. Despite a reduction in Jackson County farms from approximately 3,800 in 1945 to 1,800 just twenty years later, agricultural production continued to rise. Economic progress in Marianna since the 1960s has been slow but steady. As elsewhere in America, many retail businesses have moved out of the downtown area to shopping malls and strip developments. The completion of Interstate Highway I-10 also made it possible for the residents of Marianna to travel easily to Tallahassee, Panama City, and Pensacola to do much of their shopping. This change in shopping habits and competition by retail business giants such as Walmart, Sears, and others prompted a decline in the traditional business area of Marianna. Its older commercial buildings began to decay, and a number of them were abandoned and demolished. The widening of U.S. Highway 90 to four lanes along Lafayette Street in Marianna involved the destruction of several important architectural and historical landmarks. 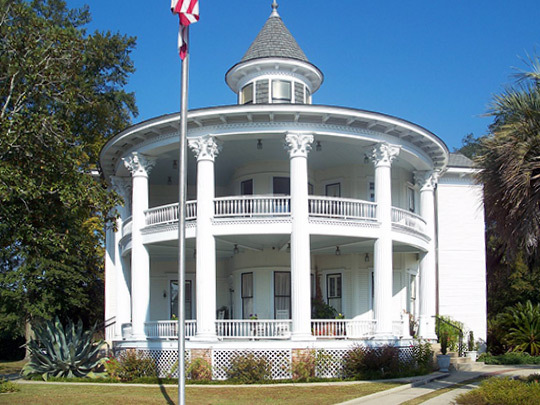 William R. Adams, Historic Property Associates, Historic and Architectural Resources of Marianna, Florida, multiple property nomination document, 1997, National Park Service, National Register of Historic Places, Washington, D.C.